Prestatyn Castle is a mid 12th century stone motte and bailey fortress, founded by Robert de Banastre. In 1157, he was charged by King Henry II to build the fortification and enlarged the township but one dramatic episode cut short the life of the castle. In 1167, when the resurgent Welsh prince Owain Gwynedd regain his eastern conquests, he destroyed the castle and seized Twt Hill. A low-lying circular ditched mound marked by a stone pillar, stands off-center within a rectangular ditched platform, which is flanked by a possible northern gate projection. Excavations in the early 20th century, revealed a substantial stone curtain wall on three sides of the bailey, of which parts were said to be still standing in 1297. 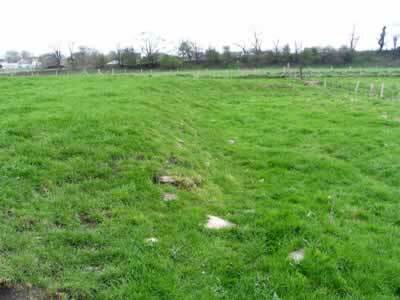 There was no stone structures or an obvious entrance found on the motte and there is no visible approach to a slightly raised northern causeway. 10 miles south-east is Holywell Castle Mound. Prestatyn Castle is located in the town centre, off Prestatyn Road. 26 miles north-west of Chester, on the A548. The site is visible from a public footpath, which passes the castle from Prestatyn Road.